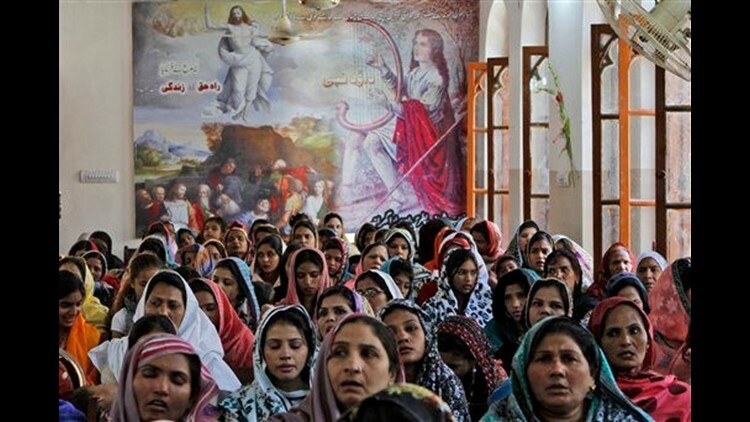 Christians across the world on Sunday celebrated Easter, the faith's most joyous holy day. At the Vatican, Pope Benedict XVI celebrated Mass on the flower-adorned steps of St. Peter's Basilica before a crowd that swelled to far beyond 100,000. "May the risen Christ grant hope to the Middle East and enable all the ethnic, cultural and religious groups in that region to work together," the pope said. In Jerusalem, thousands crowded into one of Christianity's holiest churches to worship. In Britain, Queen Elizabeth II attended a traditional Easter service with three generations of the royal family at Windsor Castle. And in the U.S., Moravians in Winston-Salem, N.C., gathered for the 240th annual sunrise service in the city — one of the oldest and possibly the largest Easter sunrise service in the nation. Here's a look at the day's rites and rituals in photos.